Many customers use voice services less intensely than data. However, when actually taking or placing a phone call, they expect reliable connections. How do the Spanish networks fulfil these expectations? Among the four Spanish operators, Orange and Vodafone support Voice over LTE (VoLTE) in their networks. VoLTE transmits voice calls as data packets over a 4G connection. This way, the otherwise necessary “­circuit-switched fallback“, which forces smartphones to switch back to 3G or 2G in order to take or place a phone call, can be avoided. Movistar and Yoigo still have to take this detour. Also, VoLTE codecs potentially support a wider audio bandwidth providing operators with the opportunity to deliver higher speech quality to their customers. On their tour through Spain, P3‘s four test cars visited 19 cities with a population of more than 100,000 inhabitants, as well as 29 towns. Also, the cars covered about 8,400 km of connecting roads. Additionally,a walktest team conducted tests in seven cities. For the voice rating, each car carried a total of four Samsung Galaxy S8 smartphones (one per operator). The walktest team carried a total of four Galaxy S8 – one per operator. The phones in the cars always called a counterpart in one of the other cars. The phones carried by the walktest teams called a stationary counterpart. The connected testing equipment registered success ratios, setuptimes and speech quality. In order to simulate normal smartphone usage, data transfers took place in the background of the test calls. In the detailled analysis of the measurement values gathered in the voice tests, Vodafone shows the strongest performance in the drivetests conducted in the larger cities and also on the connecting roads. In these scenarios, Movi­star distinctly ranks third and Yoigo fourth. However, compared to the results of the previous years, Yoigo has clearly improved. Orange achieves the shortest connection times in all scenarios. In terms of speech quality, Vodafone and Orange offer the best results in all cases. On the roads, Vodafone is slightly ahead of Orange. In the drivetests conducted in smaller towns, Orange is slightly ahead of Vodafone, particularly thanks to its excellent call success ratios in these cases. Yoigo and Movistar reach the same rank in the towns, but in some of the considered KPIs such as success ratios or call setup times Yoigo is even slightly ahead of the Tele­fónica network. This makes up for the fact that Yoigo is behind the competition especially on the connecting roads to a certain extent. In the walktests that P3 con­ducted in seven larger cities (Barcelona, Madrid, Murcia, Palma de Mallorca, Sevilla, Valencia and Zaragoza), Orange and Vodafone are on a par. Movistar is ranking third, and Yoigo is following at close distance. So, for pedes­trians or cyclists in the larger cities, Yoigo has defi­nitely become a viable alternative to its bigger competitors. VODAFONE SHOWS THE BEST VOICE RESULTS, ORANGE RANKS SECOND. even scores better than Movistar. With the volume of transmitted data permanently growing, the data discipline constantly becomes more important. How do the Spanish operators keep up with the increasing demand resulting from this development? According to their own claims, Movistar, Orange and Vodafone are competing for the best LTE coverage as well as for delivering the highest data rates to their customers. Yoigo is still mainly concentrating on expanding its 4G footprint and claims to have reached 89 per cent LTE coverage of the Spanish population now. In order to assess the performance and reliability of data connections, each of our four drivetest cars and also the walktest team carried one Samsung Galaxy S8 per operator. Supporting the LTE category 9, these smartphone types were able to benefit from the so-called carrier aggregation – the combined use of three LTE carrier frequencies which can theoretically transmit up to 450 Mbps. P3‘s testing considers fast throughputs as well as the networks‘ availability and stability. In order to assess typical performance as well as peak speeds, we consider two values: the minimum data rate that is available in 90 per cent of the cases, and additionally the peak data rate that is surpassed in 10 per cent of the cases. Web page and file downloads or file uploads reward fast speeds, while determination of success ratios and assessing YouTube playouts concentrate on reliability aspects. As YouTube streams videos at adaptive bitrates, the average value of the received video resolution is another important performance indicator. In the drive tests conducted in 19 cities with a population of more than 100,000 inhabitants, we see a close race between Vodafone and Movistar. Orange and Yoigo follow behind, with Yoigo ranking only one per cent behind its big competitor. All operators achieve excellent success ratios in the cities. Only in the category of YouTube live videos, Movistar performs slightly weaker. Overall, Vodafone achie­ves the highest score for web browsing. In the cities, it is on par with Movistar regarding this KPI. This also applies to file downloads and uploads, where Vodafone and the Telefónica network are on a par as well. 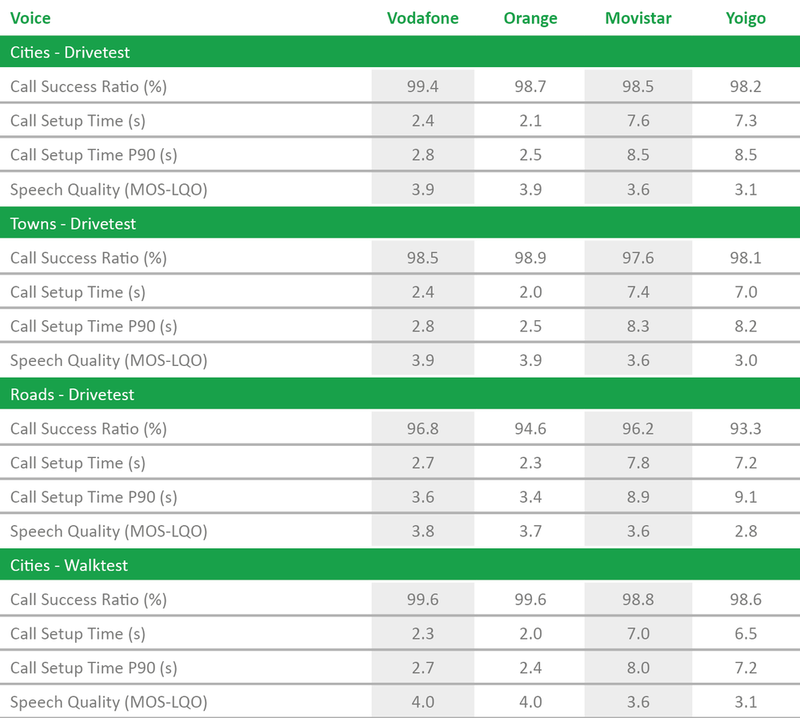 The results of the walktests conducted in Barcelona, Madrid, Murcia, Palma de Mallorca, Sevilla, Valencia and Zaragoza are similar to those of the drive­tests that took place in the larger cities: Vodafone and Movistar lead the field, with Orange and Yoigo follow as runner-ups at a not too big distance. The lead of Vodafone and Movistar is mainly based on higher data rates and also on strong performance when playing back YouTube videos. In terms of success ratios, all four Spanish operators achieve very good results except for Movistar when it comes to playing back YouTube live videos. sur­prises with very good YouTube results in the towns. On the 8,400 km of connecting roads covered by our test cars, Vodafone and Movistar performed particularly well. Here, Orange and Yoigo lag a little behind – with Yoigo only scoring two per cent behind Orange. Still, all four Spanish operators show pleasantly good results in this especially demanding category. Vodafone is the clear winner in the data discipline as well. Movistar manages to outperform Orange in this category and competes in aneck-and-neck race with Vodafone, reaching the second rank in the data tests. Orange and Yoigo each follow at some distance. Still, both perform pleasantly well in the important data discipline – including their performance and availability on the 8,400 kilo­metres of connecting roads that were covered by our measurement cars.